Klara Valentova explores mapping data from her home country. Note: In the following maps, darker colour and higher layer signify higher proportions of whichever variable is being portrayed. Map 1 presents the divorce rate in different regions of the Czech Republic in 2018. Divorces are most prevalent in the Central Bohemian Region, which surrounds the capital city Prague. Prague has a lower percentage of divorces, and one could argue that’s because young people move to Prague, where they find a partner, get married and start a family, move outside of Prague to the Central Bohemian Region, where they eventually get divorced. We can also see that there are quite high divorce rates in the North and South East of the Czech Republic. Map 2 shows the proportion of religious population in regions of the Czech Republic in 2011. The most religious regions are in Moravia, the East part of the country, while there is a little religious population in the North West. A surprising finding is, that some of these regions with very religious people have quite high rates of divorces as seen in Map 3, while in non-religious regions in the West Bohemia, divorce rates are relatively low. And so Czech Republic does not necessarily follow the believed phenomenon of religious people getting divorced less than non-religious people. Map 3 shows the distribution of people with a university degree across the regions in the Czech Republic in 2011. In general, the North and the division between Bohemia and Moravia have the smallest number of people with degrees, while in the capital city, there is an enormous peak with nearly half of the population having a university degree. The South Moravian Region has the second highest proportion of people with university education, which can be explained by the second biggest city in Czechia, Brno, being situated there. However, there seems to be no correlation between education and religion or divorce rates in the Czechia. The data are available at: https://www.czso.cz/csu/czso/home, and the boundary data for Czech regions at: http://www.diva-gis.org/datadown. 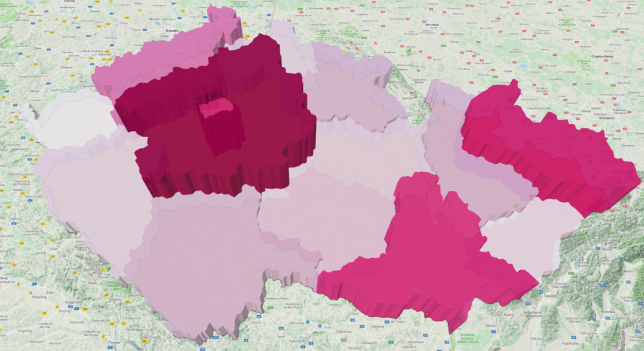 Both files were then uploaded to QGIS, joined, coloured by the proportions, and subsequently turned into 3D maps with higher areas corresponding to higher proportions to enhance the differences even more.